I recently saw this NME article about albums that will be reaching an anniversary this year. It's a typical NME piece really, big pictures and not much going on in terms of content. It also seems rather arbitrary to celebrate a record just because it's been around for a number of years ending in 0 or 5. Does an album suddenly become more influential and meaningful after 25 years than it was after 24? However, it did make me want to dig out a few of them and maybe even recommend them to other people. Although these are classic albums, maybe some of my readers are (heaven forbid) not old enough to have heard them when they were released. But surely I don't need to tell you about "Goo". Everyone knows this record, right? Although it's hip to claim that "Daydream Nation" is the best Sonic Youth album, 1990's "Goo" is the one that led most people of my generation to discover the band. So I listened to it again, for the first time in ages. Hmmm... I'd forgotten about that bit. And that bit. Maybe people don't know it backwards and inside out as I'd imagined. It's normally described as their major label debut and commercial crossover; even the NME piece calls it their most accessible. Sure, it was their first release on Geffen, but commercial? Seriously? Have these people listened to side 2? For anyone who was born after 1990 and is wondering about the object on the right - it's a DVD. Just a different shape. Now we've admired the artwork, let's put the record on. Side 1 has the songs that you've probably heard even if you don't have the album. "Dirty Boots" and especially the single, "Kool Thing" were indie dancefloor fillers at the time and would usually be played side by side with the Seattle bands who were just starting to break into the limelight. Between these sits the album's most prominent piece, "Tunic". It's not often that Kim Gordon takes the lead but when she does, the result is usually breathtaking. Here, her dreamy vocals depict Karen Carpenter looking down from heaven and speaking to her family. For many indie kids at this point, Karen was just someone in their parents' record collection and this was the first time they became aware of the genuine suffering that she went through. Athough "Tunic" is not as sonically brutal as some of the other tracks, it's certainly unsettling. Things start to get freaky before we've even reached the end of side 1. 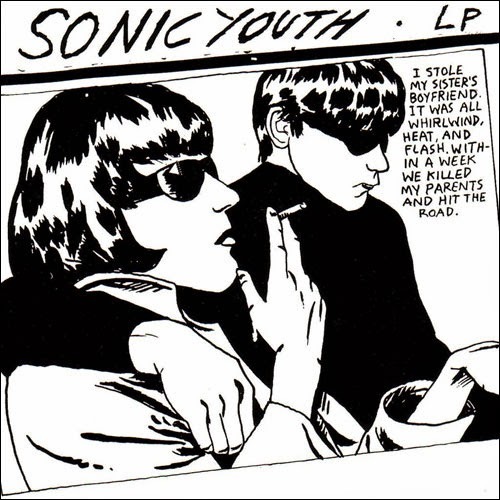 "Mote", on the face of it, has a conventional song structure, although the processed vocals can be rather disconcerting if you're not familiar with Sonic Youth's earlier work and that of their peers. I have to admit that I had never read the lyrics until I revisited the album for this article. Lines such as "I am airless, a vacuum child" and "Words don't speak, just fall across the carpet" give a sense of feeling yourself disappear and perhaps questioning your own existence. There was a hint of this in the lyrics of "Tunic" and the theme continues throughout side 2. At the point when you think the song has ended, something happens. I'm not sure what but it will make you walk over to your turntable to check why it has suddenly started playing at the wrong speed. The band then seem to return to their No Wave roots with a repetitve bass riff that gives the feeling of being trapped underwater, and this goes on for four minutes. Anyone who calls this accessible is clearly crazy. Flipping over to side 2, there's a brief respite with "My Friend Goo", which is rather silly and could even be deemed irritating, but make the most of the light-hearted interlude before the terror recommences. The songs continue to make us doubt what we'd taken for granted until now and there might even be a UFO abduction but by this point the lyrics have stopped making any kind of sense. Things come to a head with "Mildred Pierce". It starts with a spoken voice repeatedly intoning the title over a dominant bassline and some trademark Sonic Youth guitar but then it explodes into a death metal racket. I'm not sure if there are any actual words - Thurston Moore is credited with screams rather than vocals on this one - but I think I would prefer not to know the lyrics anyway. If I try to list the songs on the album without looking at the sleeve, I always forget "Cinderella's Big Score", although there's no reason why it should be forgotten. It starts with more of the droning No Wave sound that will have become familiar if you've made it this far but after two minutes it does turn into a song, albeit one that sounds like it came from an earlier album such as "Evol" or "Sister". With a slight change to the arrangement, this could have been a catchy tune, maybe even a single. But why they would want to do that? Even if they're on a major label now, they don't have to prove anything. The album closes with "Titanium Exposé", which re-assures us that everything we've experienced was a dream or something we saw on TV. But do they mean just the last 45 minutes? Or my entire life? I'm confused. This is not how I was expecting to feel after a "commercial crossover" album. 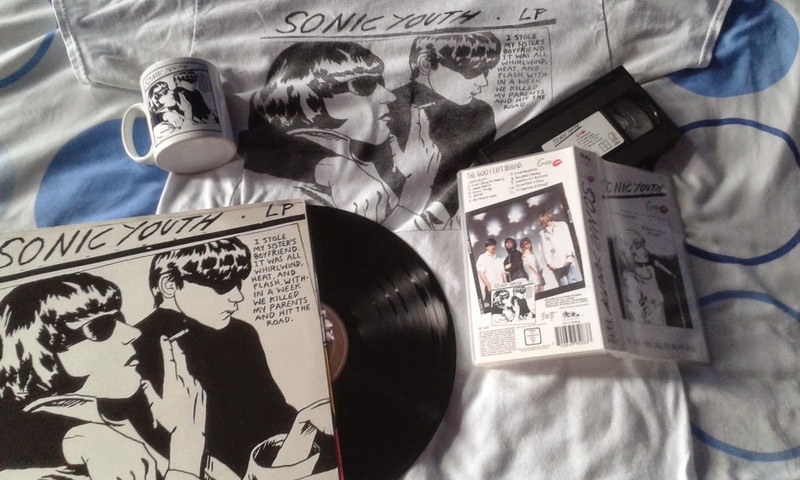 I set out with the aim of recommending "Goo" as a starting point for newcomers to Sonic Youth, but now I concede that maybe "Daydream Nation" has more tunes after all. So get that one instead then move onto "Goo" - perhaps stopping to get yourself a t-shirt along the way. I've also come to realise that I have many albums that sit neglected on my shelves because I just take them for granted. But if this experience is anything to go by, I don't know them anything like as well as I imagine I do.